This entry was posted on December 28, 2011 at 9:32 am and is filed under Cocktail Science, Manhattans. You can follow any responses to this entry through the RSS 2.0 feed. You can leave a response, or trackback from your own site. Thanks for this excellent work. This is valuable research. Thanks for doing this. Would you consider measuring the pH of some simple cocktails also? Comparisons of a Sidecar and a Margarita at 2:1:1 and at 8:3:3 would be interesting, as well as Manhattan vs Martini at 2:1. Ouroboros: I can certainly do some measurements in cocktails and report back. I think based on the raw data we could make some predictions. For example, a Manhattan will be more acidic than a Martini given the components: wood-aged spirit + red vermouth vs. neutral spirit + dry vermouth. I actually think the most interesting “next step” would be to assay sugar in some of these same ingredients. However, it’s not something that can be done easily at home and having a lab do it is apparently quite expensive. Is anyone else surprised at the lack of correlation between acidity-aperitif or, conversely, alkalinity-digestif alignments? Traditionally this is how wine classifications were generally made yet spirits seem to be all over the place. Any thoughts on an explanation? Very interesting stuff. Knowing that St. Germaine and Domaine de Canton are made by the same folks I’m curious if they have similar acidity. Hope that’s one of the next on your list! Allen: Not exactly sure what you’re asking/implying. Can you elaborate? Mike: I have some Domaine de Canton which I will measure. I would be surprised if it was significantly acidic. And even then, there’s a lot of sugar in it, one reason I’m not attracted to it. @Mike, according to http://www.spiritsreview.com/reviews-liqueur-canton.html the company is distinct from the one that produces Saint Germaine. You are so freakin cool. Please keep doing this. Definitely a bookmark. great stuff. i’m surprised i haven’t come across this sooner. i did a similar investigation a few years back that i really should revisit. i unfortunately used a pH meter that does not have great alcohol tolerance and i wasn’t confident in my results enough to keep pursuing the project. if youre interesting in learning to measure sugar. 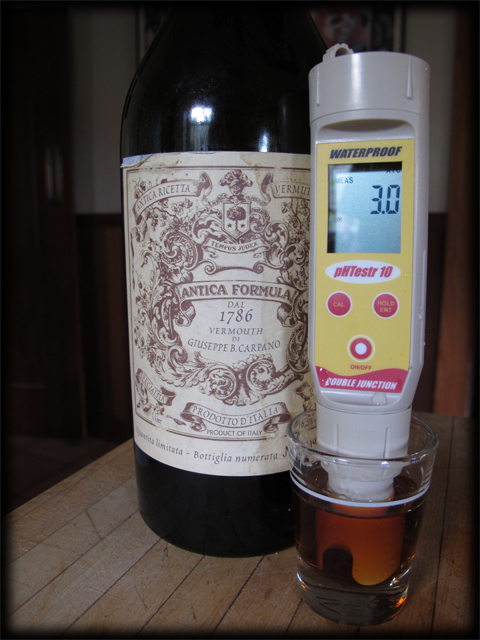 i’ve done quite a bit with it and you’ll find various posts on deconstructing liqueurs and mastering the hydrometer. this link might be a good place to start. Quite a handy graph and certainly an interesting look at what brings together cocktails! This is so fascinating! I have a question similar to Ouroboros about measuring the pH of specific cocktails. Have you checked the pH of any that use raw eggs (whites, yolks, whole eggs, etc.)? If not, is that something you’d consider adding to your list? I’d be very interested in know what you find. Have you happened to test the ph of Goslings Ginger Beer? I am taking part of a “science of cocktails” fundraiser event soon and am planning on doing a piece on PH in cocktails. THANK YOU for your work! This has been very helpful! @Colleen: I have not measured the pH of Gosling’s nor any other carbonated beverage. Generally these will always be acidic to some degree regardless of flavor because a) dissolved CO2 forms carbonic acid in water and b) acids like citric and phosphoric are usually added to sodas, in part for flavor and in part as a preservative. Fantastic information. While I wish I could say I was using it for mixing (which I have liked to do in the past) I am newly diagnosed with reflux and this is the best list of pH of various alcohols I’ve come across. Booze is a definite no go until things are better — BUT …. if I was going to splurge and have a drink, I would be choosing something close to neutral pH! Thankfully, most gins and Cointreau are close to neutral, so there are some “safer” alternatives, though I am assuming the sublime Oaked Gin that I can get locally would be more acidic. A pH meter would be super cool to have around the kitchen. I’ve tried creating some rhubarb based cocktails, but I’ve never managed to capture the smell and tartness of the rhubarb quite as I envisioned. But the pH listing could be useful in striking a good balance. Neat stuff — very much appreciated.